So how did these brilliant forecasts from our top scientists turn out? 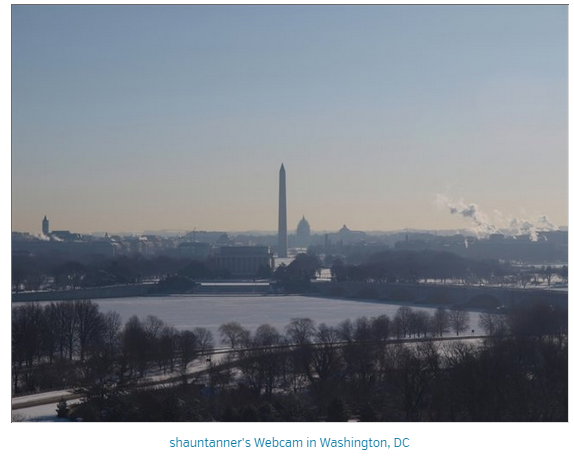 The Potomac was frozen solid in early March. This year may be the latest on record. Government climate experts are paid political hacks who don’t know understand the first thing about climate, or what controls it. 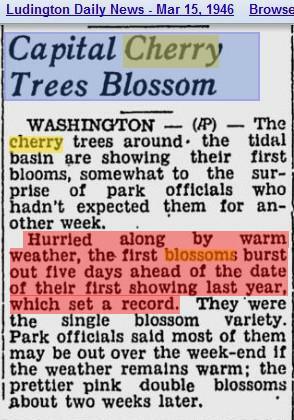 They could not have opened in 1946 that early because Mann/Jones said it was not warm enough. They gave us the “correct” temperature figure after adjustment don’t forget. Heck I am 300 miles south of DC in a warmer Plant Hardiness Zone and my trees are just this week starting to have the buds swell. No cherry blossoms yet. NC is zone 8 DC is zone 7. The global climate debate ended when manipulation of temperature data was discovered. AGW is but the latest front in the long-standing battle of the SSM (Standard Solar Model) of Earth’s heat source with experimental data. Shows the presence of superheavy elements in meteorites or formation of the solar system from unmixed debris of the Sun’s explosion five billion years ago. There you go cherry picking again! This makes those DC cherry trees global warming deniers of the worst kind!! i.e. highly visible deniers. Watch for the laughingstock-in-chief to demand that those global warming denying cherry trees be chopped down and turned into wood chip mulch. I was just out trimming the apple trees before they start budding out. Last year a combination of aggressive pruning the previous year and a late frost meant we had no apples worth keeping. I remember that 2012 winter quite well, with roses blooming in the DC area during January. But so what, DC has had mild winters as well as cold winters since its founding. Well I wish they would have polar winters for the next five years. Sorry Tony.